Andy Simpson: I know just how you feel. Q: What is "Sleepwalkers" about? Q: Does Stephen King have a cameo in the movie? 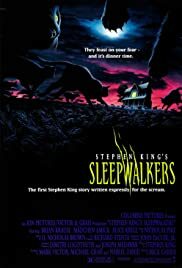 `Sleepwalkers' is a film whose main plot thrust comes from the pre-opening credits description of what the film's title means. Just about all character backstory and motivations are given here, and we are then treated to a ninety-minute entertainment vehicle that plays out these events in a simplistic but interesting manner. The film's acting, for a horror picture, is remarkably good. Brian Krause and Alice Krige give standout performances as the titular feline troublemakers who also share a disturbing Oedipal relationship, cult favorite Madchen Amick gives a wonderfully nuanced performance as Krause's troubled love interest, and the cameos by many famous faces from the horror world will give fans something to look for and smile about. Even the supporting cast members seem to be having a good time, including Ron Perlman and Glenn Shadix in relatively small but amusing roles. The make-up effects are very good, although not top-notch. They're certainly nothing amazing, but they serve their occasionally-gruesome purposes well. The optical effects look pretty dated by today's standards, but it's still interesting to see CG effects in some of their earliest forms. The transformation sequences now look like something out of a made-for-TV movie, but they don't significantly detract from the film. Where this picture does tend to fail is in its plot and dialogue. Just about all of the mystery of the story dissipates by its halfway point, leaving the audience to predict and anticipate just about everything that happens in the rest of the film, essentially destroying the tension and suspense aspects. And since this is a horror picture written by Stephen King, one would expect these two elements to be the strongest components of the film. The dialogue is at times campy and at other times overly-serious. This has the effect of making some of the characters unbalanced in many ways, something that detracts from the film as a whole. It seems the director and/or writer was/were having difficulty deciding whether or not to play this film up as a comedy or a true horror movie, and so as it stands it awkwardly lies somewhere in between. `Sleepwalkers' is not horror at its finest, either in terms of ability to truly frighten or to provide fun campiness. It straddles the line between the two, existing somewhere equidistant from both. It is never too over-the-top for us to laugh out loud with it, nor is it ever truly scary enough to make us shiver. As it stands, it is an extremely simple and very entertaining work of filmmaking, something that horror fans will enjoy and others should probably avoid.